The Online Legging Store kept popping up in google ad sense ads and on my facebook feed. I adore tights that aren't boring plain old black and grey! I was after something exciting and boy they deliver on that! The Online Legging Store has hundreds of styles each one as crazy as the next. Everything from Disney themed to country flags. I was after something fun but not too crazy and something pretty. The prices ranged from $8 to $29.99. My intention was to buy one, but there were so many others I wanted as well as the first pair I picked out. So I ended up buying three pairs! Oops! Customer Service: My customer service was great from the start. 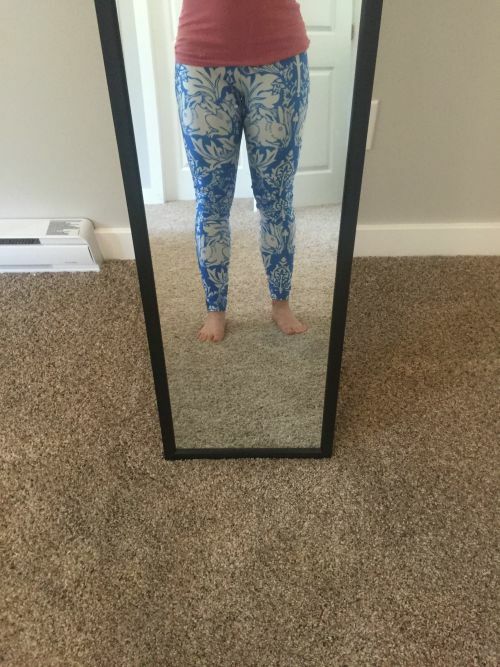 I actually ended up ordering the wrong size because I was so excited about the cool leggings coming to me that I completely forgot to select the correct size. When I realized the mistake I made I emailed a reply to the order confirmation email. Their response came right away and the employee assured me it was corrected and the right sizes were on the way. "Hmmmph that was really easy" I thought. It was clear there was an actual person behind the emails, which I love. Also to note I found their website easy to navigate and there was a size chart on every page- cool. The only thing I would suggest to them is they ask to have more detailed pictures- ie close ups. Otherwise gold star on this one. 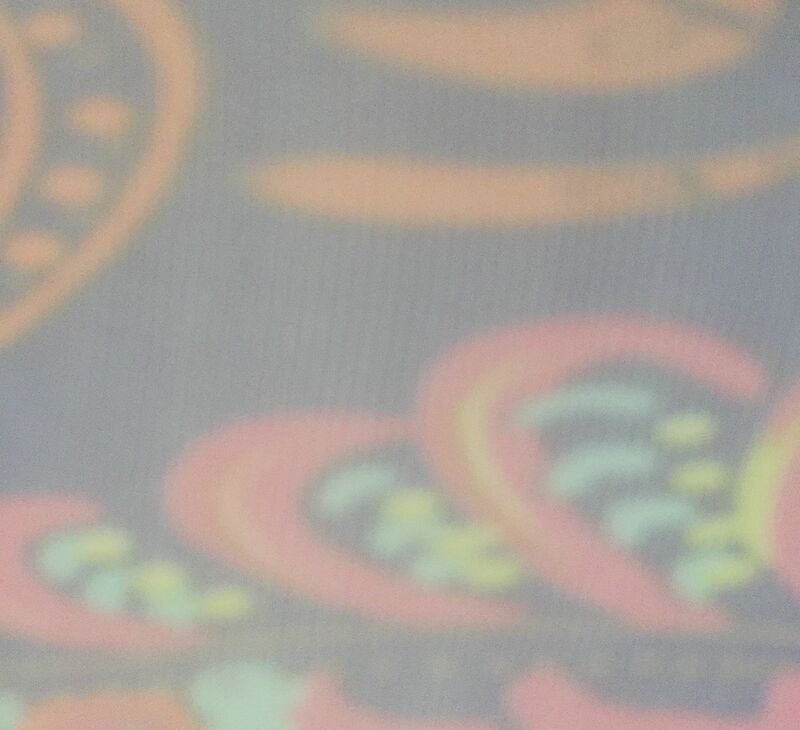 Material/ Fabric: This is so strange to me.... Most knit (ie stretchy) fabrics, especially the cheaper range one - which lets face it these are super cheap- you can see right through. Remember the Lu Lu Lemon fiasco? Ya almost all stretchy fabrics you can see through when you bend over, even the expensive ones, but worse so for the cheapy one. But oddly these ones you can't see through! 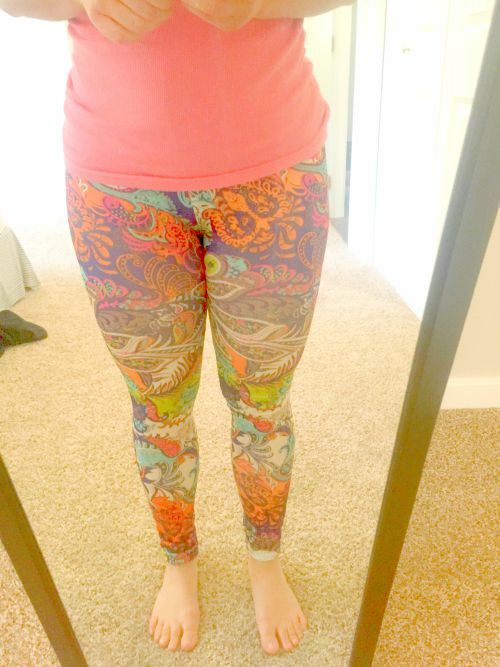 What DOES happen when stretch is applied to these leggings is... the color fades. 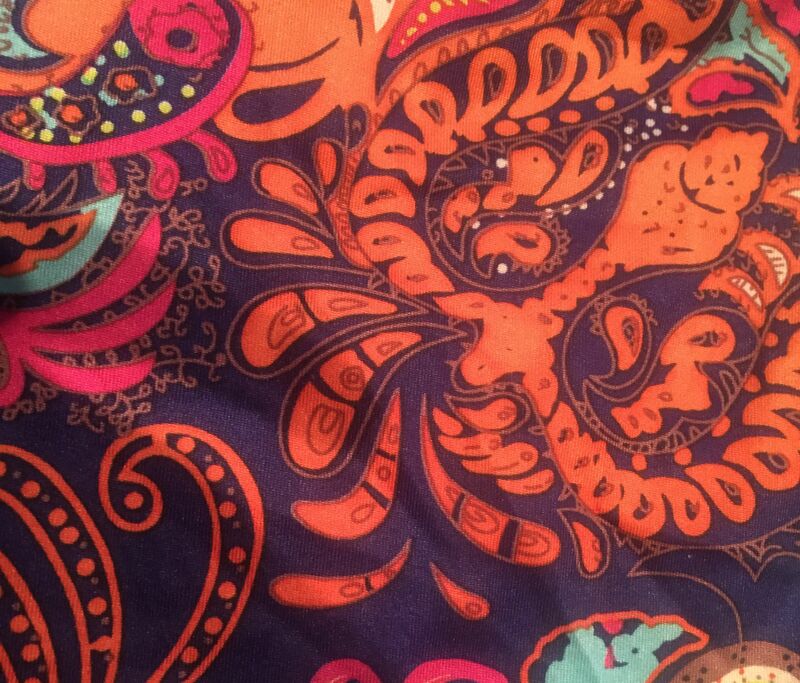 Soooo my beautiful dark purple, orange, bright blue and green swirly pattern leggings, are color faded in the thigh area. I have a little body- tiny waist, small bones, small upper body... and huge speed skater thighs (my nick name is quadzilla- and I love my strong legs but that's another review entirely). And I ordered larges. So here's my advice, If you have small, (teeny tiny) thighs order whatever you want. BUT if you're blessed with big strong legs like myself either order a light color (or a light color over the thighs, the rest can be dark and bright) or don't order these at all. I'm actually really really disappointed that my favorite pair look ridiculous on me. One other thing I should point out is that there is a tiny bit of sheen or a shiny finish to these. All three pairs had it, so I'm going to assume absolutely all of the tights from the Online Legging Store have it. It's not enough to bother me, but it may bother other buyers. Fit: Well like I stated above I got larges, to accommodate my tree stumps for legs. And I'm hugely disappointed in the color fade in the thigh region when it stretches. Thats never happened before, and I usually wear Lululemon size 8 or 10 and it doesn't do that -shiny because it's stretched too far- thing. The two other pairs I bought were lighter colors and I didn't notice color fading at all, so it might just be the darker colors that fade with stretch. Otherwise they actually feel great, not constricting at all. One thing to note is they are extremely high waisted. I can pull the waist band WELL past my belly button. on the website it doesn't show that. I love that, but some ladies like to wear it low so I thought it would be good to mention. I thought it was weird the 3 pairs didn't all feel the same size. The white and blue ones seemed tighter than the crazy orange and purple ones with the fading problem. Weird. Quality: Well they were mass produced in China so keep that in mind, so quality isn't high. Infact it's quite low. But these crazy leggings may not be in fashion for long. (My older friends argue that they aren't in fashion NOW, but seriously I'm not taking fashion advice from a 62 year old man who wears nothing but Lee's jeans and plaid button up shirts- would you?) My guess is that these leggings will out last the trend anyway and did I mention they were super cheap? There you go. You get what you pay for. What's missing on the high quality front? Well for starters they use black thread on everything, even the pretty white and light blue tights, so yes you can see the stitching. Oh well for me not a deal breaker. The waist is the kind of gathered elastic waist band from the eighties. I chuckled when I saw that but hey the eighties are back so rock it if you want. I'm wearing shirts that cover my belly button anyway, so it'll never be seen. Last of all, the stitching isn't that tight and it looks like I'm applying stretch even when I'm not. It's not something someone would notice unless you point it out though, so it's nothing to worry about in my books. Value: They nailed it. Like really deliver a fun product that is super cheap. I like these leggings, but I'm sad the purple and orange ones have a color fading problem. If you have skinny legs, don't mind less quality stitching, want something fun and different and are one tight budget these leggings are absolutely a must try.